It has been a while, so Happy New Year! At this time of year, I tend to do a great deal of thinking about Scent Trail and where I see the business going. I am not sure I come up with any answers, but I do plan new products and we have quite a few in the pipe-line. This may mean that some of the current lines are dropped, but I am still thinking about that. Shortly to be released is a lovely lip balm made with olive wax and therefore suitable for vegans. When I did my research, I realised that most lip balms and actually balms in general seem to contain beeswax. I am not for one second doubting the efficacy of this wax, but it does mean that the vegans among us are left out. So, recipe sorted and I have been using it all winter. It has stopped my lips drying out which, when you consider the wind that we have had to put up with, is remarkable. The trouble I have had is deciding on the flavours (I have to get used to not saying fragrances). I asked a few people and the consensus seems to be CHOCOLATE. I can’t say I am surprised. It is a girl thing. So there will initially be three varieties: Chocolate, Unfragranced and Grapefruit and to flavour them I have found some natural, organic aromas. Nothing synthetic, thank you very much. 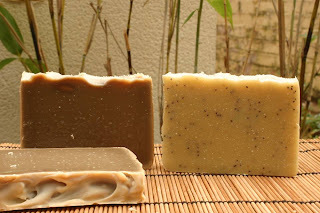 For quite some time, I have been talking about making a beer soap, but with one thing and another, I have not got around to it. So, this afternoon I popped out and bought some organic beer and bit the bullet and made my first batch. 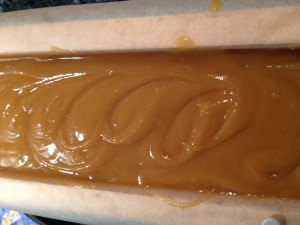 Fragranced with a unisex blend of essential oils including Cardamom, Palmarosa and Vetivert it is now in the mould, and looks like toffee. I am really liking this blend with its citrus undertones and will interested to see how it developes. Knowing how keen you will be to see it in the mould, ta da! here is it. I have to say, that I really do not like the beer lye water. Core blimey it was stinky, but I think I can live with that if this turns out to be as good as I hope. Hopefully tomorrow you can see the soap cut. I recently joined Stampin Up as an independent demonstrator. One of the things I love about the company is the quality of the products, and the fact that you can make money doing what you love. As an inveterate crafter, I have always been on the look out for versatile stamps and beautiful cards and papers. I did a lot of card making a few years ago, using embellishments because I always found the available stamps so uninspiring. I have a large box of stamps which I bought at the time but hardly used, and I had a look at them recently. There was only one which I still like, the rest will be consigned to lurk at the back of a cupboard, possibly never again to see the light of day. What I like about Stampin Up is that everything is colour co-ordinated. Select your card and ink in a certain colour, choose your stamp, possibly some pretty paper and then finish with ribbon, brads or buttons in that colour. For those who are a little challenged, or possibly scared of colour co-ordination, this is the perfect. The only thing you need to supply is inspiration and a little time. To celebrate 25 years, Stampin Up have announced a fabulous special offer for anyone in the UK who wants to join. Instead of the normal £99 joining fee, for which you get £130 worth of products, for a limited time you can join for £25. This gets you £26.95 worth of products plus the business pack. One of the great things about Stampin Up is that there is no pressure to do workshops or demonstrations. There are people who do just that, but others who are hobby crafters and have joined just for fun. Whatever the reasons for signing up, you will join a growing number of fabulous, supportive, creative crafters. This limited offer is available until 21st October so don’t miss out. If you are in the UK and do want to join, click www.moonsongdesigns.wordpress.com and then the "Join My Team" link. New Products and new packaging. Since being made redundant I have re-found my enthusiasm for soap making. Whether that is because life is a little less stressful (as long as money is taken out of the equation), or because the weather is good, or because I have the time to play I don't know, but I am having fun. There are two new soaps on the curing rack and another on its way. The first of the two soon to be ready, is a soap specially designed for the gardeners among you. Fragranced with a beautiful blend of Lavender and Clary Sage essential oils, it has nettle powder for a touch of colour, and poppy seeds for exfoliation. This blend is becoming a firm favourite here, not too floral or herby, but a lovely light scent. 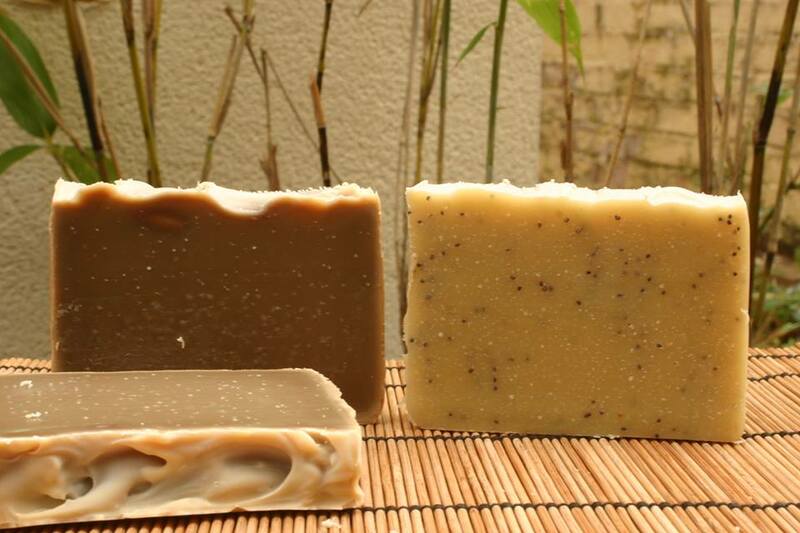 The second soap is Bergamot and Green Tea, seen on the left in the photo. This soap set up really quickly and the depth of colour really surprised me. Soap packaging has had a revamp. The boxes will be made of plain, coloured card and labels will be in a neutral colour. There is a new Liquid Soap fragrance. Orange and Pettigrain has joined the party and they have all had new labels too. I am very happy with the way all the packaging is finally coming together in a more co-ordinated way and hopefully it will not be long before there are new style labels for all the products. I have been a little quiet of late, not without good reason. For soap and cosmetics makers large and small, the regulations changed on 11th of this month, and we now have upload details of all our products to a Portal (otherwise known in this establishment, among other less polite things, as the black hole). For those who think that this should be a simple task, may I remind you that this black hole was invented by someone in Europe and that it has, therefore, been made as difficult as possible. The requirements are simple enough - a photograph of the packaged item, the formulation, an image of the label and a few other small details which are effectively drop down or tick boxes. What "the powers that be" have failed to understand is how many small soap/cosmetics manufacturers there are, and for most of the last week the system has, when working at all, puttered along so slowly that there has been a mass, Europe wide, tearing out of hair. To add to my particular woes, I have been unable to upload a single pdf or image of my products until today, which would have meant I was unable to sell them, at least legally. The big question now is who is going to police this, and check that the products have been correctly uploaded? I cannot see anybody trawling through the database looking at every one of the 1000s of uploaded recipes and checking that it is not harmful. The other issue, of course, is that there are people who have never properly complied with the regulations, so why would they start now? These are the people that "the powers that be" should be more concerned about; the people who do not have their products assessed, do not list the allergens and do not care. The people who do care are those who are now hairless, stressed and worried that they have not uploaded their products correctly. Finally, after months of development, the Scent Trail Luxury Face Oil is ready. We have selected 6 lovely, light oils which absorb beautifully, leaving no sticky residue and added a touch of the gorgeous Neroli for its uplifting fragrance. Skin feels soft and beautifully nourished. Suitable for all skin types. Organic Baobab Oil: said to improve skin elasticity. Contains Vitamins A, D, E and F.
Kukui Nut Oil: High in Omegas 3 & 6 which help prevent water loss and improve skin elasticity. Olive Squalane: Indentical to one of the components of sebum. Helps to restore suppleness and skin flexibility. Cranberry Oil: Contains a high percentage of Tocopherols, Tocotrienols (components of Vitamin E), phytosterols and Vitamin A. It can help protect against environmental pollutants. Pomegranate Oil: Helps promote collegen synthesis and improve skin elasticity, strengthening the epidermis. Summer arrived, and went. We are now back to Autumn and I have had about enough. This is the strangest year for weather that I can remember, although Mum tells me that when we had a heatwave in the 1970's we had snow in June, so perhaps there is hope. Following on from last year with all the rain we had I have my fingers crossed that things pick up soon. I need to start doing some decorating. The house is driving me to distraction and there is a lot to do. I spend more time than is healthy looking at Pinterest and there are some gorgeous rooms on there which make my house look very shabby. I am shortly going to be having the house re-rendered, and once the internal walls have dried out, I can finish decorating the lounge (started 12 months ago) followed by the dining room. The bathroom needs tiling as does the kitchen. I think I have decided what to do in the bathroom, but I am not the best at tiling and the tap end of the bath is shaped so it is going to be a nightmare. I have a week off shortly, and there is a long list of things I need to do, including re-stocking soap for a fair, or series of fairs depending on how the first one goes. It will be at a new venue about which I have heard good reports so I am hopeful that I do well. All I know is that something has to change, and I need to sell more. I am thinking about soap styles and whether or not mine is working. I suppose that it take a while to create an identifiable style and I don't think that I am that creative. Last week saw the shocking death in Woolwich of Drummer Lee Rigby who was murdered in broad daylight by two, British born Islamic fundamentalists. Rigby served in the Royal Regiment of Fusiliers and was a brave young man, who by all accounts served his country well and deserved far better than this. What has struck me, apart from the brutality of this senseless act, was the bravery of three women who tried to help him. One of them talked to one of the attackers and tried to persuade him to hand over his weapon, whilst two others tried to get between the men and their victim. This bravery, contrasts wildly with the cowardice of the men who killed Lee Rigby, for cowards they are. What their motives might be who knows, but if it is to strike fear into the hearts of the people of this country then they have failed. It has brought the English Defense League out from under their large rock, but it has also brought hundreds of normal, well balanced people to Woolwich to pay tribute and lay flowers. People of all colours and religious persuasions have united to condem the attack which has also been roundly denounced by Imams all over the country. What this attack has served to do is unite the country, increase support for our armed services and to show the world the true spirit of the British people. When they first start out, soap makers have to decide if they are going to use fragrance oils, or essential oils? I suppose that it all depends on how "natural" you want your product to be. It is true, that fragrance oils are cheaper than essential oils, but many essential oils are of a reasonable price, and you don't need to use a huge amount, so you can easily use them to fragrance your products. If, like me, you have horribly expensive taste, a blend using a combination of cheaper and more expensive oils is the perfect solution. Essential oils are volatile oils obtained from various parts of plants and they have been used for healing and fragrancing for centuries. There are floral ones, woody ones, citrus ones, smokey ones the list goes on. Take a walk through a fragrant garden, a park, and orange grove and much of what you smell will have an essential oil. 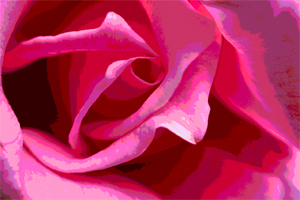 Rose Otto: One of the most expensive, the oil is distilled from the petals. When I think of Rose, I think of the Mughal Gardens of Hyderabad, or the harems of the Royal Household where Attar of Roses was used to fragrance the air. The ultimate romantic fragrance it is used in many high end fragrances. Rosewater is a by-product of the production of essential oils and is used in cooking, mainly of the Middle East, and can by used as a facial toner. A suitable alternative to Rose essential oil, is Rose absolute which is a good deal cheaper. Violet Leaf: One of my current favourites,and another expensive oil. 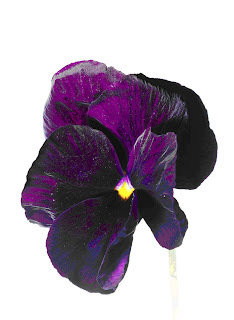 Violet Leaf absolute (Viola Odorata) is a very complex essential oil with strong green notes and a beautiful, floral violet undertone. It is extracted from the leaves of the plant and the absolute has a dark green colour. It is absolutely beautiful on its own or in a blend.